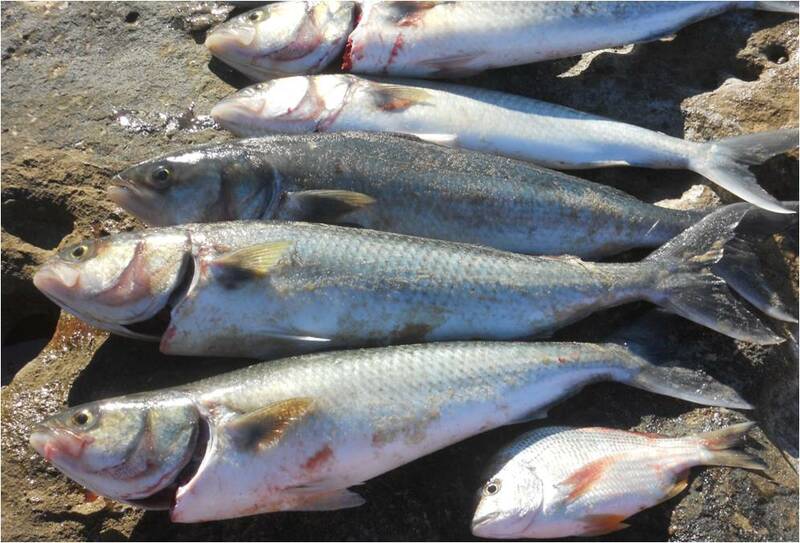 The June round of the Harbord Bowling Club Fishing Comp was held last weekend with good weather and small seas. The fish of the month was the Australian Salmon (Kahawai). 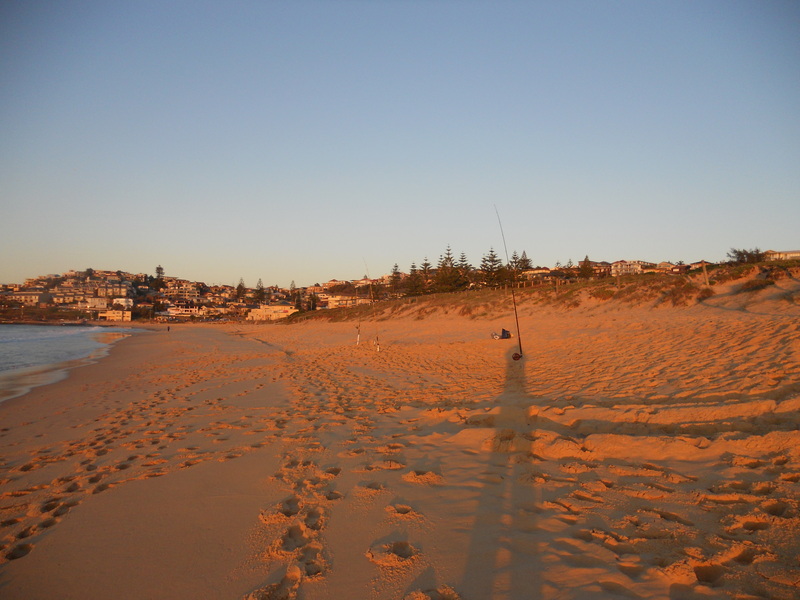 I decided that with all the kids playing sport, high tide being at roughly 3.30am Saturday morning and just after 4pm in the afternoon I would have 2 fishing sessions, early morning and late afternoon to catch both the tides. 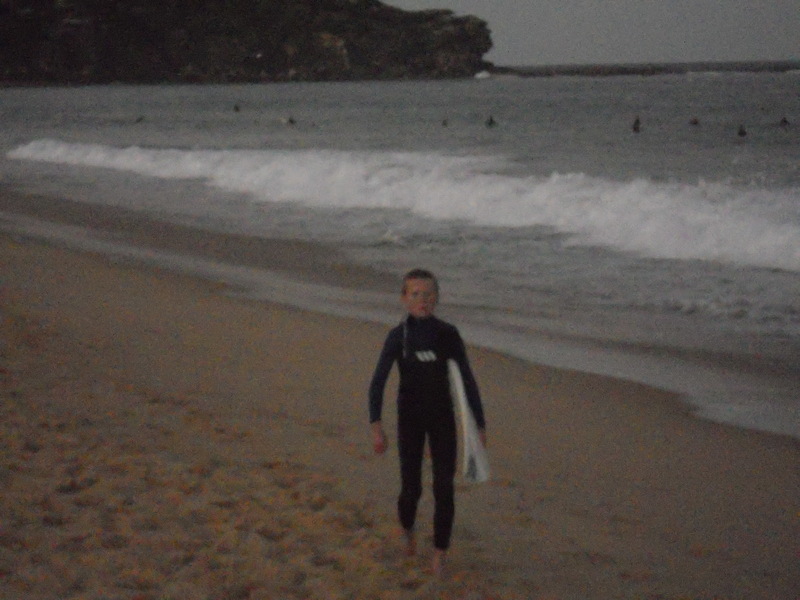 At about 4am sneaked out of the house and was down at Curly beach, set up and baits in the water within 30 minutes of falling out of bed, but with clear sky, lots of stars and little wind, it was pretty cold. I had the previous day picked out a channel/rip running out in the middle of the beach and hoped it would hold some fish. I setup 3 rods – 2 with a standard running ledger and the one with a Bristol Channel style pulley rig. The 1st 30-40 mins saw no action except me drinking a flask of coffee to keep warm, until finally a decent whack of a bite on 1 of the rods …. but whatever it was, was gone quick sharp. But shortly after a series of small bites got the rod tip bouncing again and I caught my 1st fish, a small bream – at least I had something to weigh in. I should not have worried, as the sun came up, every 20-30 minutes a school of salmon swam through the channel and mayhem would ensue, as 1 or 2 of the rods would buckle over as a salmon tore off with the bait. Ended up catching 4 salmon around 2-3 kilo’s each before heading home around 7am. After household chores, walking the dog and Ryan’s league game went back to the same spot around 4pm for the afternoon session. Mini-me came down and went for a surf whilst I again setup 3 rods, this time 2 with pulley rigs and one with a running ledger. I sent out the pulley rigs baited with pillies and squid on the other rod. Managed to start catching salmon in a similar fashion to the morning, the school would come through and the pillie rigged rods would buckle over. Packed in the fishing on dark, mini-me had got a few waves and I had caught my limit of 5 salmon and had returned quite few more. Hoped there might have been a jewie about but no such luck. At the weigh-in Sunday afternoon, turned out all the other members most of who fish in boats could not catch a salmon ……”The G” told me that schools of salmon offshore were feeding on eyes (minute fish) and where hard to catch. A lot of fish weighed in flathead, mac tuna, snapper, bonitos, mowie and leatherjackets to name a few ……. 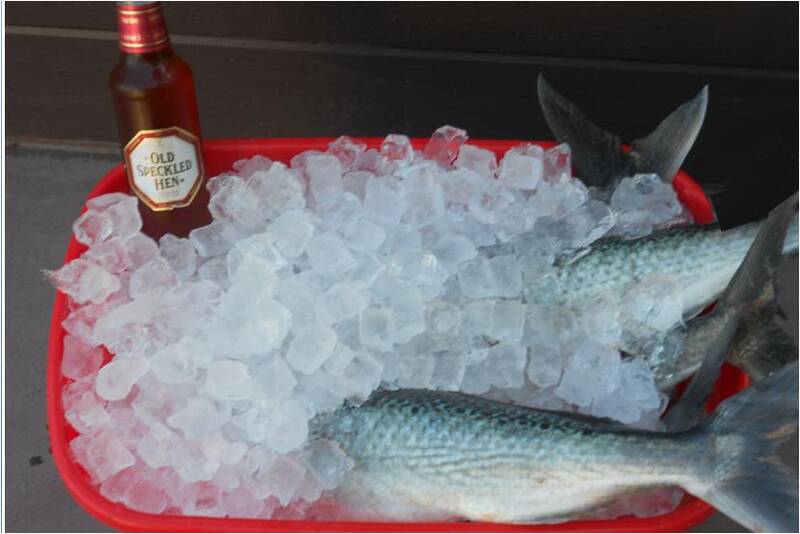 plus a few beers and a couple of ciders, but the upshot was I managed to take out the fish of the month comp with 5 (about 10 kilos) salmon and 1 small bream. Now to the Old Speckled Hen, picked up 6 pack from Brookie cellars – a bit pricey but a great English ale. Very smooth, no fizz, a dark amber colour, reasonably potent – a rich creamy beer. Definitely recommend trying this one, particularly if you enjoy English beers and have been starved off them for a while. Mate sensational post you had me reading with pensive anticipation until the end. I bet that reeling in a 10 keg Salmon off the beach is a heck of a lot of fun. Great work and congratulations on the win. Just shows you don’t need have to have a flash boat to catch good fish! !